Strengthening the awareness and participation of the interested parties in the protection and conservation of the national CAs through education and awareness of conservation and the value of the CAs. 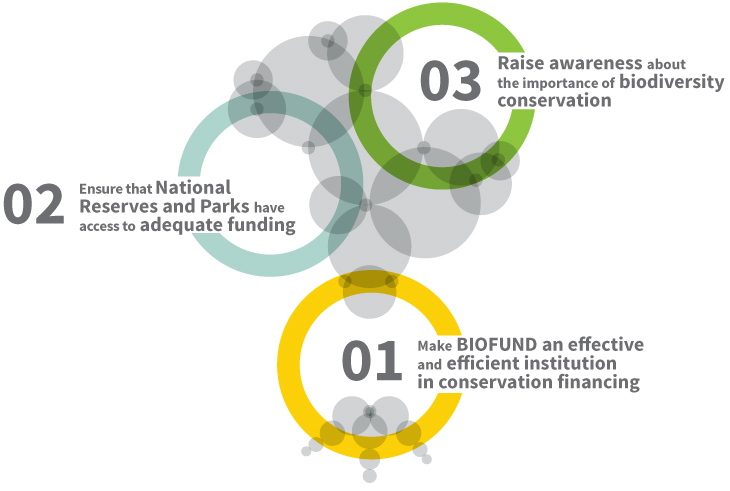 The BIOFUND Strategic Plan, drawn up in a broadly participatory process which involved several ministries, the conservation community and cooperation partners defines clearly the main directions of BIOFUND’s activities in the three pillars mentioned above. In the first phase of its life, up to 2015, all the efforts of BIOFUND were directed at its internal organisation in order to achieve its first strategic objective. In effect, the first step was to acquire the necessary technical capacity and the institutional solidity to allow the Foundation to carry out correctly the functions of a CTF. The positive assessment of BIOFUND, at the end of this phase, led the various partners to sign the financial agreements which allowed the constitution of the endowment. In the second phase, which we called the Pilot Phase (2016), the main activity was to test and adjust all the normative and action instruments before starting the regular financing of the national parks and reserves, in compliance of the 2nd strategic objective. Despite this main focus, efforts were also made in the area of environmental awareness (Strategic Objective no. 3). In the current phase, the Phase of Full Functioning, the development of the Foundation, the expansion of its means of intervention and specific actions aimed at this have allowed attainment of the third strategic objective, alongside the consolidation of the first two objectives. The Bee Project is the main activity undertaken by BIOFUND in the pilot phase. Its general objective is to begin the disbursement of funds to the CAs to support the recurrent running costs. Starting to work with just a single conservation area, in 2016, it is expected that, by 2018, BIOFUND will be financing, under project Bee, at least 8 Conservation Areas. Other results expected from Project Bee will be the updating of all the regulatory instruments for BIOFUND’s activity, notably the Disbursement Manual, and the mastery, by all those involved, of the established rules and procedures. A further objective of Project Bee is institutional improvement of the areas which at this stage do not enjoy the conditions to apply for financing from BIOFUND.